Get in Shape This Summer With Free Fitness on the Lawn! There’s always something fun to do in Destin, whether it’s a family-friendly event down at HarborWalk or a boat show at Destin Commons. What we love most is when an event is free! And what better way to enjoy the beautiful weather this summer with free fitness on the lawn? Every Monday, Wednesday, and Friday from May to July, The Market Shops in Sandestin is hosting an hour of fitness and fun. From 9 to 10 AM, everyone is invited to attend, no matter their fitness level! 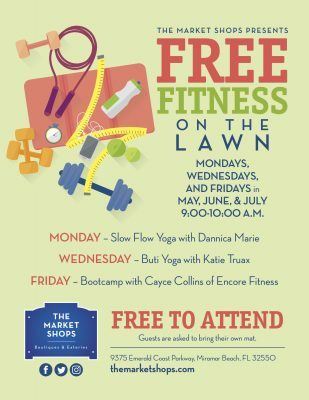 From the most accomplished yogi to someone who’s looking to get back in shape, enjoy free fitness on the lawn this summer. On Mondays, start your week off right with Slow Flow Yoga with Dannica Marie. Slow Flow Yoga is a gentle, yet challenging, workout, and will help participants with flexibility, mindfulness, and awareness of breathing. After you finish this, you’re sure to be feeling relaxed and rejuvenated! Mid-week on Wednesdays is Buti Yoga with Katie Truax. Buti Yoga is a high energy workout that combines tribal dance with intense cardio moves. You’ll work your abdominal muscles to help strengthen and stabilize the body. This is sure to be a great workout, so get ready to sweat! On Fridays, finish off the week with Bootcamp with Caycee Collins of Encore Fitness. If you’re looking to get lean for the summer, this is the workout for you! High-intensity interval training keeps you moving and grooving, all while working up a sweat. For more fun things to do in Destin or local events happening in your area, visit the Gulf Coast Events page!